Asics Gel Kayano 22 are stability cushioned running shoes. 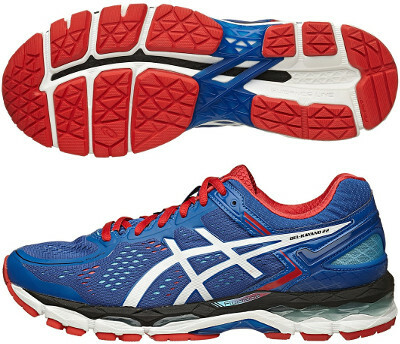 The Asics Gel Kayano 22 renews the spirit of the flagship from the japanese brand for overpronators. Despite high price the Kayano 22 is very popular among runners for long distances featuring plush cushioning, stability and premium comfort. Besides the "Lite Show" edition which provides increased visibility under poor light conditions, Asics has released the Kayano 22 New York City to celebrate the famous marathon. The Kayano 22 uses FluidFit™ reinforcements over reengineered mesh in the upper for a better adjustment of the athlete's foot not only matching all expectations with lightweight breathability but also slight weight reduction from its predecessor the Gel Kayano 21. Exoskeletal heel counter wraps the heel for improved support. Generous cushioning starts from the ComforDry X-40 sockliner that adds around 40% more bounce back and durability than a standard one and finishes with DuraSponge outsole in the forefoot which is made from a blown AHAR compound for responsive cushioning and flexibility. The midsole features rear and forefoot Gel® cushioning system for responsive shock absorption on impact between bouncy FluidRide® layer on top and stable and durable SpEVA® underneath. Midsole also includes specific pronation control technology (dual density Dynamic DuoMax®) in the internal side to improve stability.